Trevor Brown, a bartender at Tupelo, spearheaded the idea for the drink that won the Park City Area Restaurant Association’s Summer Cocktail Contest. It is the first time that Tupelo has won the competition. Prepare the Luxardo/Port reduction and combine with Rye, Canton and lime juice. Add ice and share vigorously. Strain into Old Fashioned glass using a Hawthorne strainer and add fresh ice. Top with club soda and express some lemon peel before garnishing with lemon peel and mint sprig. 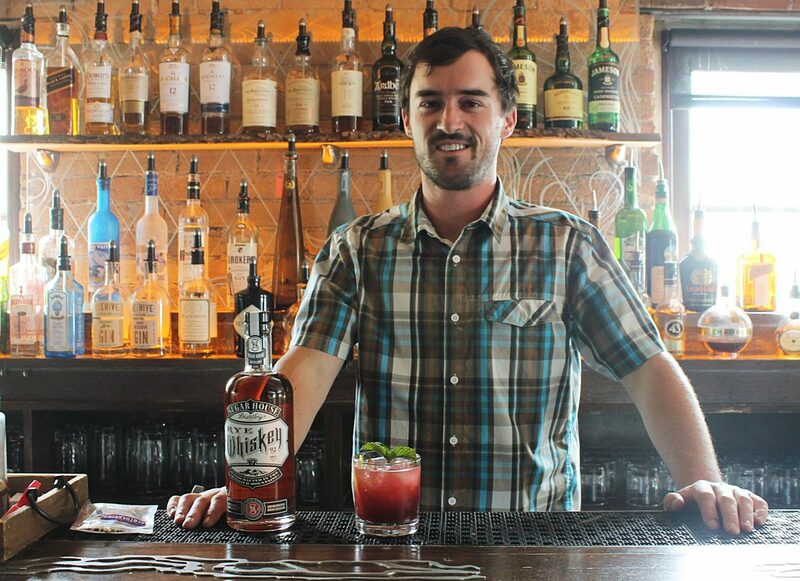 All throughout July, it was not uncommon for Nicholas Barton to check Tupelo’s ranking in the Park City summer cocktail contest every hour. When the end of the month approached, he upped the frequency to multiple times an hour. The voting closed at midnight on Aug. 1, but Barton, bar manager of Tupelo, waited to celebrate until he got an email from the Park City Area Restaurant Association at 12:15 a.m., confirming that Tupelo had won the association’s annual competition. Tupelo took first place out of 23 local restaurants with its “Cherry in the Rye” drink. The recipe for the cocktail was concocted by a team at the restaurant, led by bartender Trevor Brown. Brown said that he got inspiration from classic cocktails such as the whiskey sour and mint julep. “But we made it our own with the port and cherry reduction,” he said. Cherries were used because they were in season, and Tupelo prides itself on its farm-to-table menu that uses local, seasonal ingredients, Barton said. Brown said that he started working on the cocktail earlier this summer in preparation for the Savor the Summit event in June. Barton and Brown saw how popular the drink was at the event and decided to use the recipe in the upcoming competition. When the voting started on July 1, Tupelo quickly shot up to the top. “We overtook the first place maybe two weeks in, and then it was a battle for first or second clear to the end,” Barton said. Tupelo and Handle, with a drink called “Handle Your Summer,” were neck and neck until the end, Barton said. When Tupelo pulled through, everyone involved celebrated. It was the first time that Tupelo has won the award after years of entering the contest. The staffers did have an incentive to keep them going, though. Brown promised that he would throw a party for the staff if they won, using part of his $200 cash prize. He intends to keep that promise. One of Brown’s favorite parts of the contest is that it pushes him and other mixologists around town to try new recipes and master their skills, which boosts the quality of the cocktail scene in Park City. Plus, he enjoyed hearing the buzz around the community throughout the month. The contest brought Parkites to local restaurants, including Tupelo, especially as people saw that the drink was hanging around the top spot. “Cherry in the Rye” was the restaurant’s top selling drink last month with a total of 213 sold. The day after the competition was over, Barton said that the bar was filled with people who came to specifically meet Brown and have the “best cocktail” in Park City. “It’s such a great way to build the community,” Barton said.